Online travel company Cleartrip has reported revenues of INR 273.21 lakhs in FY 16-17. Cleartrip is a major player in the online travel industry today. The latest financial statement from the company management shows that revenues for the company have more or less been steady without much movement between FY 15-16 and FY 16-17. The balance sheet also shows not much movement in losses over the same period. 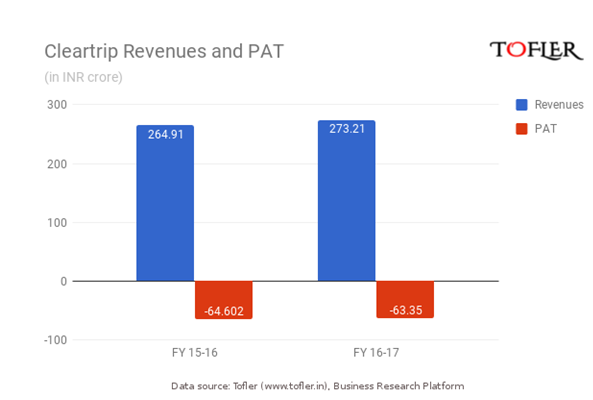 In FY 15-16, Cleartrip saw losses of 64.6 crore, which fell marginally to 63.35 crore in FY 16-17. Cleartrip has been hoping to break even for a few years, and though it hasn’t happened yet, losses have fallen by 28% since FY 14-15. Interesting to note is the additional profit and loss statement reports a gross income of INR 302.66 crore from airway operations in FY 16-17. The company’s airway division appears to be the largest division in terms of revenue. Revenues from operations includes commissions from hotels, airlines, railways and other affiliate travel management companies, as well as service charges and cancellations from the use of their portal. The company also earns revenues from incentives earned from airlines, the sale of tour packages and fees from their Global Distribution Systems service provider. The company also reported expenses of INR 336.57 crore in FY 16-17. 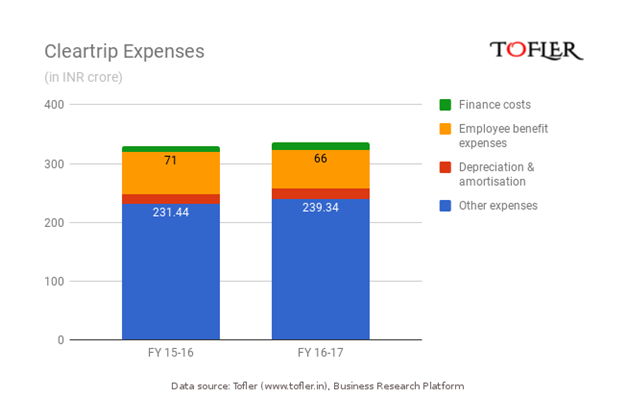 Again, there has been very little movement in expenses since FY 15-16, when expenses stood at INR 329.51 crore. The bulk of expenses come from the salaries and wages of employees. Finance costs are also make up a significant portion of Cleartrip’s expenses. Cleartrip is an online travel agency (OTA) and owned and operated by the Mumbai-based Cleartrip Private Limited. The company was founded in 2005 and provides online booking services for hotels, flights, trains, buses and tour packages. Cleartrip numbers among India’s top 3 OTAs along with Yatra and MakeMyTrip. MakeMyTrip has 25% of the country’s market share. In the area of hotel booking, Cleartrip also has competition in Oyo Rooms. Coffee Day for gift cards.